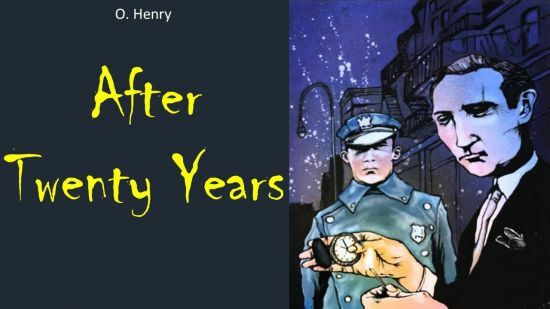 After Twenty Years Summary is adapted from the great works of O. Henry. The incident in the story takes place on a dark, windy New York City business avenue where a policeman discovers a man standing in a dark doorway. The policeman on the beat moved up the avenue impressively. The time as barely 10 o’ clock at night but the chilly gusts of wind with a taste of rain in them had left the streets empty and deserted. When about midway of a certain block, the policeman suddenly slowed his walk. A man was leaning in a doorway of a darkened hardware store with an unlighted cigar in his mouth. As the policeman walked up to him, the man quickly explained that he was waiting there for a friend. It was an appointment that had been made twenty years ago. You may also like to read, Guliver’s Travel Summary. The man said, “About that long ago, there used to be a restaurant there. It had been called Big Joe Brandy’s restaurant.” The policeman confirmed that the restaurant had been there till five years ago when it had been torn down. The man in the doorway stuck a match and lit his cigar. The light showed a pale, square-jawed face with keen eyes and a little white scar near his right eyebrow. His scarf pin was a huge diamond, oddly set. The man said that he had been dined at Big Joe Brady’s restaurant exactly twenty years ago with Jimmy Wells, his best chum. He had been eighteen and Jimmy was then twenty. He was to start for the West to make his fortune while one couldn’t have dragged Jimmy out of New York. They had agreed that night, they would meet there again, exactly twenty years from that date and time, no matter what their condition might be, or from what distance they might have to come. Also, read The Adventures Of Huckleberry Finn. The policeman found the incident quite interesting and asked him if he had heard from his friend since he had left. The man replied that they had indeed corresponded for a time. But after a year or two had lost track of each other. But he was sure Jimmy would meet him there if he was alive for he had always been the truest, staunchest old chap in the world. The waiting man pulled out a handsome watch, the lids of it set with small diamonds. He said that he had done pretty well for himself in the West and he hoped that Jimmy had done half as well as him. There was then a fine, cold wind drizzle falling, and the wind had risen into a steady blow. And in the door of the hardware store, the man who had come a thousand miles to fill an appointment smoked his cigar and waited. After twenty minutes, a tall man in a long overcoat walked up to him. “Is that you, Bob?” he asked doubtfully. “Is that you, Jimmy Wells?” cried the man in the door. “Bless my heart!” exclaimed the new arrival. “It’s Bob! Well, well well! How has the West treated you, old man? Come on, we’ll go around to a place I know of and have a good long talk about old times.” You may also like to read, The Adventures Of Tom Sawyer. Bob trembled a little while reading the note which said, “Bob, I was at the appointed place on time. When you struck the match to light your cigar, I saw it was the face of the man wanted in Chicago. Somehow, I couldn’t do it myself. So, I went around and got a plain clothes man to do the job. Your friend, Jimmy!” Also, read The Wooden Horse.